When it comes to April Fools’ Day pranks, car manufacturers have a long and varied history. Indeed, press offices go into overdrive on the morning of the 1 April, with manufacturers all vying for the best spoof car launch or news story. Some are brilliant, while others would put a Christmas cracker to shame. We round-up the very best (and worst) of the April Fools’ Day pranks from car manufacturers. We’ve all been there. You're on your way home after a couple of social drinks and suddenly you need fast food. Do you wait until you get home and attempt to make a dodgy sandwich with stale bread and Marmite? Of course not. Instead you ask your taxi driver to stop off at the local kebab house for a quick doner. Now, thanks to Vauxhall’s new Taxi Kebabi, having your kebab and getting home is no longer a problem. 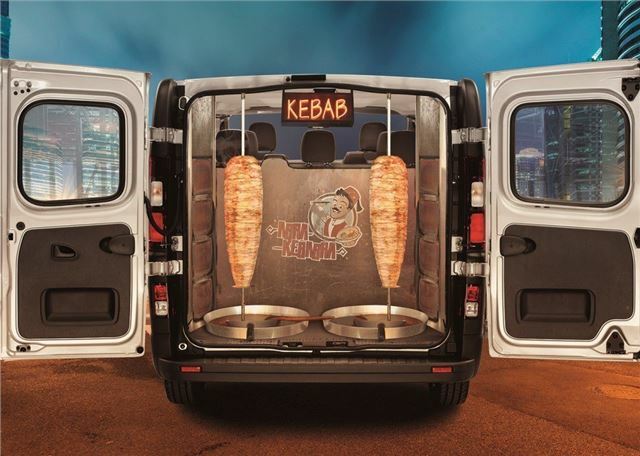 Indeed, this first world problem has been solved with a specially converted Vivaro features two gas-fired spit rotisserie grills, salad bowls integrated into the arm rests, chilli dispensers.